Shark scientists have questioned basking shark migration for decades since an article in 1954 proposed that basking sharks, which were hardly seen once cold weather hit, hibernated on the ocean bottom during the winter. A tagging study released in 2009 finally revealed that basking sharks head south in the winter, further than scientists ever dreamed. The basking sharks that spend their summers in the western North Atlantic are not seen in that area once the weather cools. It was once thought that these sharks might spend their winters on the ocean bottom, in a state similar to hibernation. Scientists finally got a handle on this question in a study published in 2009 online in Current Biology. Researchers from the Massachusetts Division of Marine Fisheries and their colleagues fitted 25 sharks off of Cape Cod with tags that recorded depth, temperature and light levels. The sharks swam on their way, and by wintertime, the scientists were surprised to find them crossing the equator - some even went all the way to Brazil. While in these southern latitudes, the sharks spent their time in deep water, ranging from about 650 to 3200 feet deep. Once there, the sharks remained for weeks to months at a time. 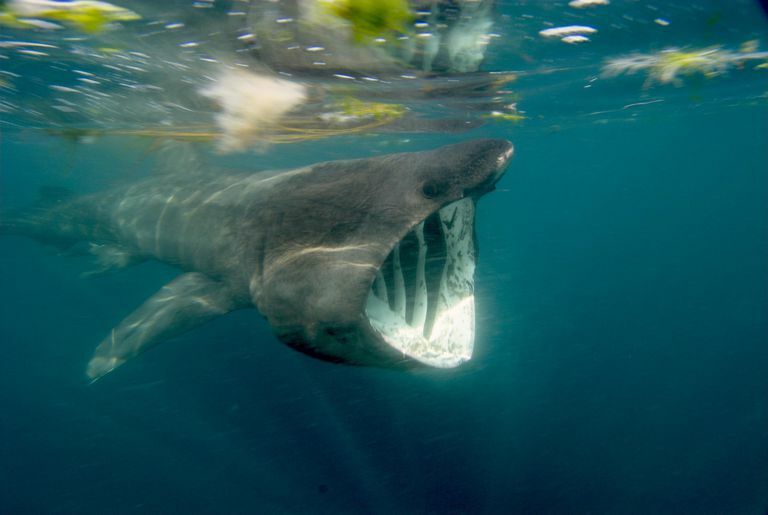 Studies on basking sharks in the UK have been less conclusive, but the Shark Trust reports that the sharks are active all year and during the winter, they migrate to deeper waters offshore and also shed and re-grow their gill rakers. In a study published in 2008, a female shark was tagged for 88 days (July-September 2007) and swam from the UK to Newfoundland, Canada. Even though the mystery of where Western North Atlantic basking sharks go during the winter has been solved, we still don't know why. Gregory Skomal, the lead scientist in the study, said that it doesn't seem to make sense for the sharks to travel that far south, as suitable temperatures and feeding conditions can be found closers, such as off of South Carolina, Georgia, and Florida. One reason might be to mate and give birth. This is a question that may take awhile to answer, as nobody has ever seen a pregnant basking shark, or even seen a baby basking shark.